2012 October – Don't We Look Alike? What beautiful pages! Over the Moon, written and illustrated by Karen Katz, is a lovely tale of adoption for very young children. The story is presented with a sense of fantasy, giving it a fairy tale quality. The night after the new baby is born, a woman and her husband who are “far away” from the baby both have dreams of the same baby. They know that this is their child and travel a long distance, “over the moon and through the night,” to get to their baby. The mode of transportation is real–a giant airplane. This blend of fantasy and reality places the notion of adoption into a larger mythological structure and connects with the child’s individual story of adoption. Likewise, in the illustrations, Katz softens the boundary between fantasy and reality. The colors are bright, which serves to highlight the more realistic tones of the human characters. In this book, the mother has the same black hair as the baby, while the father has brown hair. The baby’s skin tone is darker than that of both parents. The pictures are collages of papers with various painted small prints, such as stars, dots, and flowers. This conveys the hint of scrapbook pages and provides a homey, folksy, whimsical experience. This is a fairly standard response to children who are adopted. Cheri Register, in “Are Those Kids Yours?”, argues that this is actually a dangerous path to travel. She believes that without teaching the cultural context for “wasn’t able to take care of you,” that the questions some children will inevitably ask lead to answers that devalue the birth mother’s experience and ultimately the child himself. She also argues that when children discover that if they didn’t adopt that particular child, they would have adopted another, and that that knowledge undermines the idea of “meant to be together” or “choosing” the child. Regardless of whether or not you agree with Register, there is a distancing that goes on with the phrase “another lady’s tummy” that makes me uncomfortable. This book is meant for the very young child, and because of its poetic nature, is meant to be a springboard for discussion, not a manual for how to talk about adoption. The book takes a very complex and individualized situation and opens a door through which adult and child can enter. Being in the study will mean completing one online survey. The survey does not ask for specific identifying information, and all of your survey answers will be kept confidential. If you complete the survey, you will be given an opportunity to provide your email address and be entered into a drawing for an iPad 2. If you are the selected winner, you will be contacted through this email address so the iPad can be sent to you. Email address will be separated from the survey data and destroyed following the completion of the drawing. If you want to learn more, or have questions, please email Heidi at heidi.brocious@utah.edu. Contacting Heidi or going to the website doesn’t mean you have to participate. You can decide at any time, or just ask Heidi more questions. Please address your questions directly to Heidi, not to this blog. What a wonderful delight to be tagged with the One Lovely Blog Award nomination by The Attic Room blog (http://bekahgraham.wordpress.com/about/), which is written by a Fulbright alum who was an English Teaching Assistant in Taiwan and is now starting her professional life as a writer and editor. Marisha and Luanne are thrilled to be honored in this way by a fellow blogger and thank Bekah for her support, inspiration, and encouragement. Since starting our blog in July (2012), we’ve been so gratified to find loyal readers, so this is also a thank you to all of you. There are rules that go along with accepting the nomination. Upon a little Google search of the award, we noticed that the rules change a bit from recipient to recipient. We suspect that they were developed (in the same general format) to promote camaraderie among bloggers, so we are all for them! 1. Although the blog makes it look like our desks are back to back in the same office, we actually communicate mainly by phone conversations, texts, emails, and blog maintenance. Skype and Face Time are not efficient enough, but they might be more fun. Marisha lives in Los Angeles, and Luanne lives in Phoenix, and it takes six hours to visit one another. We did get to spend time with each other this past weekend when we attended a lovely wedding in Pasadena. Marisha danced in 5″ heels and Luanne went dumpster diving in her silk top and pants to check out ingredient labels for hubby’s gluten-free diet (he has Celiac disease). 2. Marisha is very social and Luanne is less so. However, Luanne can talk more than Marisha, in a pinch. Both of them think they are good therapists, although neither one has a diploma or a shingle for that line of work. 3. Marisha can roll her tongue into a taco or a burrito, depending on her mood. This is a possible resume point, considering that she’s an actor. Luanne used to be able to balance on the very tips of her toes, barefoot. Although she can no longer do this, she remembers doing it, and that’s almost as good. 4. Marisha and Luanne are writing a play based loosely upon their adventures in adoption. Nothing beats putting everything into dialogue (conversation, yakking, pontificating haha, chatting)! See communication above in #1 and #2. 5. Marisha is Keurig home-brewed coffee and Luanne is Diet Coke. Marisha is turkey sandwiches and Luanne is fish tacos. Marisha is hummus and veggies. Luanne is blue cheese, strawberry, and walnut salad. Marisha is skip-dessert and Luanne is baklava. Marisha and Luanne are both white wine. 6. Marisha and Luanne share a love for musical theatre. Marisha majored in the subject in college. Four years of singing, dancing, and acting. Luanne is an enthusiastic audience member. Both of them love to share notes after performances, critiquing and reviewing like mad–as if they had to get their review to the NYT editor by 2AM. 7. Both Marisha and Luanne LOVE cats. The family has a total of 5 cats. Most of them live with Luanne, although Marisha grew up with them. The 5th cat is Marisha’s cat Izzie who lives in LA with Marisha. She drinks fresh water out of a cup like a human and plays fetch with a toy mouse. Enjoy sampling from these other blogs!!! In my last post, I mentioned that momentous little question. It came in a phone call from my friend Kim in late 1986, and it changed our lives. But though the question looms large in our family lore, it doesn’t stand alone, and it didn’t come out of nowhere. It’s a link in a chain, a thread in a fabric that looks like a crazy-quilt map of the world. I’ll start the journey in New Delhi. John and I lived there from 1981 to 1983 as newlyweds and journalists, and that’s where we became friends with Kim and her husband — his name is also John, so I’ll call him JH. Kim is China-born and New Jersey raised. JH is a white guy who grew up in Hawaii. They were affiliated with the US Embassy, and JH was also my running buddy. On Sunday mornings we’d run 12, 15, 17 miles through the dusty streets and markets of New Delhi. The threads of our lives stayed intertwined. After leaving New Delhi, John and I spent a year in Honolulu, not far from where JH grew up. Then all four of us wound up back in the DC area. Then we were trying to adopt a child, and so were Kim and JH. In 1986 we had an adoption fall through after the baby was born. (I talked about that in my last post.) That same year, Kim and JH, after doing a lot of networking all over the country, adopted a US-born baby girl (her birth mother was Vietnamese). New Delhi, China, Hawaii, Vietnam, and various parts of the US mainland. But let’s keep going. Late in 1986 John was named Beijing bureau chief of the Baltimore Sun. (Yeah, this was back when newspapers had things like foreign bureaus, lots of pages, and money. But I digress.) We’d be moving there in late spring of 1987, after a few months of intensive Mandarin language study in Monterey, California. Suddenly, I couldn’t hear the newsroom hubbub. Suddenly, I forgot about my deadlines. All I cared about was hearing what Kim had to say. She and JH had just heard from a lawyer in Honolulu, one of a number of attorneys they’d contacted months earlier when they were trying to adopt. The lawyer had heard from a fellow attorney based in LA. He in turn had had a visit from a 27-year-old woman, about five months pregnant. The young woman had traveled to California from her home in the Philippines specifically to arrange for an adoption and give birth, and she was hoping that at least one of the adoptive parents would be Asian. Reasoning that many people in Hawaii are of Asian descent, the LA lawyer contacted his Honolulu acquaintance, who then contacted Kim and JH. “And we’re moving back!” I exclaimed. And so, three days later, we were in the lawyer’s office. We learned more about the young Filipina woman. We filled out forms and wrote essays for her. And very soon, though neither of us was Asian or Catholic – something else she’d originally hoped for – she chose us. We’ll never know what it’s like to conceive a child, experience a pregnancy or give birth. But we do know what it’s like to have a birth mother choose us, and we cannot imagine a more profound gift. Our Filipina daughter was born in Los Angeles. The crazy-quilt map of how she came into our lives includes not only the Philippines and LA but also India, Hawaii, China, DC, and much more. Like so many parents who have children by adoption, I look at my family and think to myself: It’s a wonderful world. Part 2: Sometimes Things Don’t Work Out. And Thank Goodness for That. “Twinprints” discusses reunion after the honeymoon period. Come next February, it will be four years since I learned who my birth family is. From the beginning, we recognized we were in unchartered territory, and we said as much to one another. That’s where the title of this blog comes from, and the book that I am writing. I morphed the word blueprint–a model, a prototype, a guide–into twinprint. 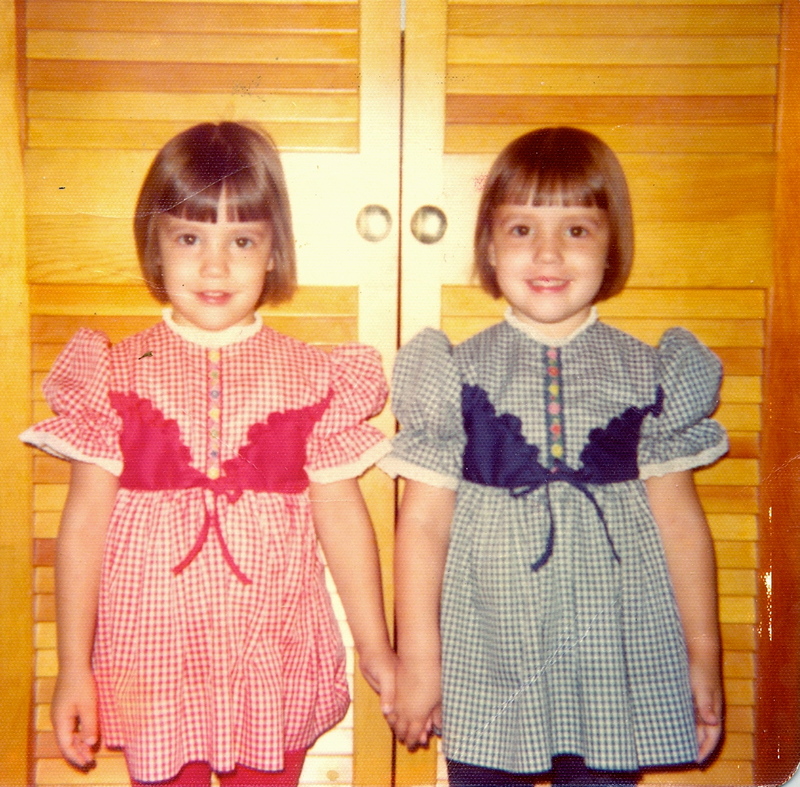 More than being adopted, or being from the Midwest, or being this or that early defining thing, I have been guided in so much of my life by being a twin. I don’t feel lost in that part of myself. Mama, Can You Hear Me?? The reality show is a fresh take on American Idol. It started in the UK and has made it to its second season here in America. What I like about this show is that it is about more than someone having “The Voice.” It seeks to find someone who is the whole package, to find a person who can be marketable and worthy of a 5 million dollar investment. The audience “meets” all these hopefuls of all different ages, with one commonality and sharing one dream– to be a music superstar. Now two parts of my life have intersected. As this blog does each week, X Factor has now showcased an issue about adoption. Contestant David Correy is currently in the Top 24, in the “over 25” group. He first stood out to me, not because of his voice, but because of the dream he wanted to pursue more than a singing career. He was adopted and has never known his birth mom. He touched me when he gave a speech about hoping that his Brazilian birth mother would come find him “through his voice and through his story.” It was sweet, heartfelt and definitely an original story for a contestant on a reality talent show. But for anyone who is adopted, underneath our fantasies, we know that it usually doesn’t happen that easily. I have mixed emotions because I, too, always imagined that if my career took off, maybe my birth parents would recognize me, or hear my story and come forward. But then I have the opposing thought: would I get a bunch of impostors “pretending” to be my parents? Would it be emotionally damaging to go through this in the public eye? Thank goodness for DNA tests haha. I really wish David well. I have an emotional pull for him, regardless of his beautiful singing ability. What do you think? Will David’s dream be easier with fame? Or do you think it will make things a lot more complicated? Will it set him up for disappointment?